30 years, 6 months, 0 day old age. Krishnappa Gowtham will turn 31 on 20 October, 2019. Only 5 months, 29 days, 21 hours, 43 minutes has left for his next birthday. Krishnappa Gowtham has celebrated the total number of 30 birthdays till date. See the analysis by days count and bar graph. Krishnappa Gowtham was born on 20-10-1988 in Bengaluru in the state of Karnataka, India. He is an Indian Cricket Player. 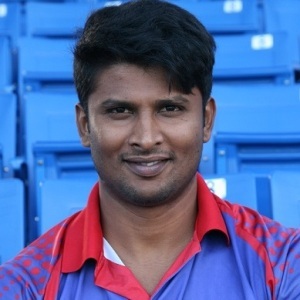 Gowtham's professional career began when he was picked for the under-15 zonal tournament in Bangalore where he emerged as the second-highest wicket-taker. He played his first Ranji Trophy game for Karnataka in November 2012, against Bengal, and picked up two wickets, both in the second innings. In the 2016–17 Ranji Trophy season, Gowtham picked up two consecutive five-wicket hauls, against Delhi and Assam, helping his team win both the games. In the latter game, he returned his career-best figures of 7/108. In February 2017, he was bought by the Mumbai Indians team for the 2017 Indian Premier League for 2 crores. Gowtham, in fact, received an opportunity to bowl at an Australian side touring India way back in 2008, just because his action was similar to that of Harbhajan. While his action has changed bowler now, he certainly derives his inspiration from the legendary Indian spinner. Gowtham was picked for a camp conducted by Karnataka State Cricket Association (KSCA) and got to meet legendary Indian spinner, Erapalli Prasanna. The camp was for around 20 days and Gowtham got to work closely with Prasanna. The off-spinner fondly remembers his time with Prasanna in the camp and even holds on to the notes he took down from the legend. The former Indian bowler had asked Gowtham to work on his run-up to the wicket, which proved to be a masterstroke in his career. After a prolific performance at the domestic level, he was in the radar of various franchise at the IPL player auction 2018. He earned a whopping INR 6.2 crores contract with the Rajasthan Royals. He made justice to his price tag by being their one of the best buys of the auction. He bowled in the powerplays economically and also won them games with the bat as well. His franchise will expect the same in 2019 season as well. He is a huge fan of Harbhajan Singh. When he had started playing, his bowling action was quite similar to that of the legendary off-spinner. Over the years, he has changed his action. Krishnappa Gowtham picked 18 wickets in his first three Ranji Trophy matches in 2016. He was immediately picked to play for India A in 2017. He was mentored by legendary spinner Erapalli Prasanna. He considers his time spent with the veteran to be career defining. He was bought by MI in 2017 auctions but didn't feature in any game.